When your child was an infant, you worried that taking him outside your house may place him at risk. As a toddler, you baby-proofed your entire house to keep him safe indoors. Now that he’s going to school, you can no longer control his environment and keep him sheltered from outside risks. This loss of control can be difficult to bear, but your child needs the freedom to play and socialize. Unfortunately, this freedom can revolve around playgrounds and play structures that may not be as safe as you would like. In fact, playground accidents occur all the time, resulting in 200,000 child injuries per year. Examine environment prior to play. Playgrounds can be full of potential hazards. However, you can limit your child’s risks by examining the area before you allow him to run, climb, and play. Check structures for splinters, loose boards, sharp edges, and broken materials or debris. You should also make sure that the playground equipment is age-appropriate and located away from high traffic areas. 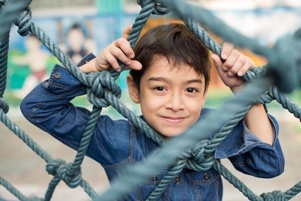 Any ropes, chains, poles, or cables should be properly secured and devoid of any holes or loops that could ensnare or trap your child. Remove hazardous materials, clothing, and items from your child before he begins to play. Loose clothing, drawstrings, scarves, jewelry, and headbands should be removed from around the neck prior to your child’s play. These items can easily be snared or caught on equipment and pose a potential strangulation risk. Speak with your child about safety and proper play etiquette. The best thing you can do to keep your child safe is to educate him about safety and the consequences of certain actions and risks. Parents and monitors should discourage unsafe behaviors, such as equipment misuse, fighting, running or climbing on unstable structures, or crowding and pushing each other on equipment. Need more information on child injury prevention? Interested in seeking liability damages for injuries sustained on public play structures? If so, please take a few moments to browse our extensive collection of Blogs, FAQs, and resource materials. You can learn a lot about your child’s rights and how to successfully pursue an insurance claim. The Andrew Kim Law Firm, PLLC can also help you better understand whether you have a case worth pursuing, as well as help you build a strong claim. When it comes to your family, we don’t play around. Contact our office today for the guidance you and your child need.